Note: This guide is for clients of accountants where the accountants use AutoEntry to help manage the client's accounts. Where the owner of the bank account(s) already has access to the relevant company in AutoEntry, refer to the self-setup guide. 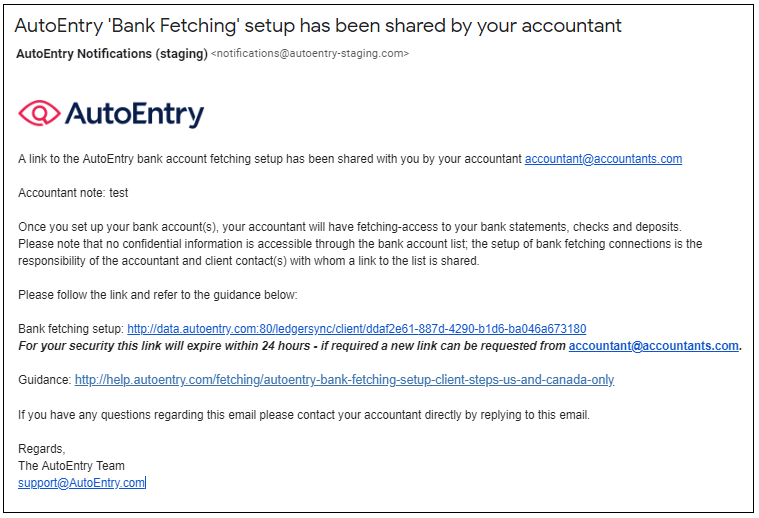 A new feature of AutoEntry called ‘Bank Fetching’ allows your accountant to connect their AutoEntry account with your bank accounts so that they can automatically sync and download your bank documents and transactions, and thus streamline the whole accountant-client workflow. AutoEntry Bank Fetching supports over 900 banks and credit card feeds in the US and Canada - the full list of bank feed connections supported is included here. To set up this solution, your accountant requires you to enter your relevant bank credentials into a secure AutoEntry form as a one-time exercise. You can do this without having to log in to AutoEntry – instead your accountant will send you a link (or email – see below) that will simply give you “live access” to the relevant ‘Account List’ setup table in AutoEntry. No confidential information is accessible through the bank account list in the link – information entered here is encrypted, stored securely and used only to access your online bank accounts on a regular basis and/or on-demand for the sole purpose of your accountant to use in their AutoEntry account. Your accountant can provide further information about this service. For security reasons the link provided to you will expire in 24 hours from when it is originally activated by your accountant. When a link expires (or if manually deactivated by your accountant), the resulting web-page will display a message “Bank Fetching setup link expired” (together with the email address of the accountant who activated the link). In this situation contact the accountant in question and they can simply generate a new one for you. When you click on the link that your accountant has sent you (manually and/or in the email), you will be brought to a web-page showing the Bank Fetching ‘Account List’ table. 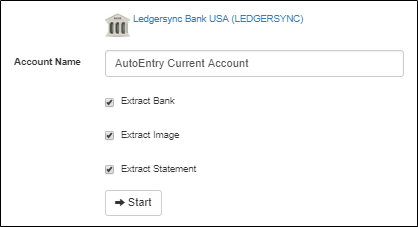 This is a “live version” of the same table available to your accountant in AutoEntry – bank accounts that you add will instantly be reflected there. There are instructions above the table, which are given in more detail in the steps below. i) Select the ‘+Add’ button. ii) Search for the name of your bank. iii) Assign a custom-name to the bank account (optional). iv) Enter your user ID and password for that bank account. It is important that you leave the ‘Save’ option checked as highlighted below - this is to facilitate the daily sync (if you have already added a bank account with the ‘Save’ option unchecked, you can re-check it by simply selecting the orange ‘Change’ button beside that account and re-entering your credentials). v) Stand by and monitor the screen while details are verified. Note that the bank may request additional “2-step” authentication (security questions, tokens etc) – either immediately (example below) or via subsequent status messages (those that relate to 2-step authentication can be found at the top of the full list). vi) Once all authentication steps are complete, your bank documents and transactions will start syncing and downloading directly into AutoEntry for your accountant. vi) You can continue to set up other bank accounts using the same steps.